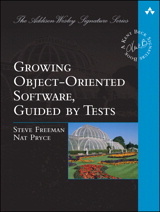 “Growing Object-Oriented Programs Guided by Tests” by Steve Freeman and Nat Pryce (Amazon). My bible. :) A fantastic book about test-driven development. I touched upon it in my post Test-Driven Development Done Right. “Implementing Lean Software Development: From Concept to Cash” by Mary and Tom Poppendieck (Amazon). An amazing book on continuous improvement and customer focus in your software development organization. See also my post Lean Software Development. “Code Complete, 2nd edition” by Steve McConnell (Amazon). A great and practical book on how to write good code. “Design Patterns: Elements of Reusable Object Oriented Software” by Erich Gamma et. al. (Amazon). The Book on design patterns. A must-have. “Peopleware: Productive Projects and Teams” by Tom DeMarco and Timothy Lister (Amazon). A book on what is required to create an productive software development organization. Pretty interesting facts in there. “How to Win Friends and Influence People” by Dale Carnegie (Amazon). A classic about how to build good relationships and how to handle people. “One Minute Manager” by Kenneth Blanchard and Spencer Johnson (Amazon). A classic about how to manage people in order to get them as happy and productive as possible. This entry was posted in Personal Development, Software Development and tagged book by Johnny. Bookmark the permalink.